Ginger Lemonade !!! 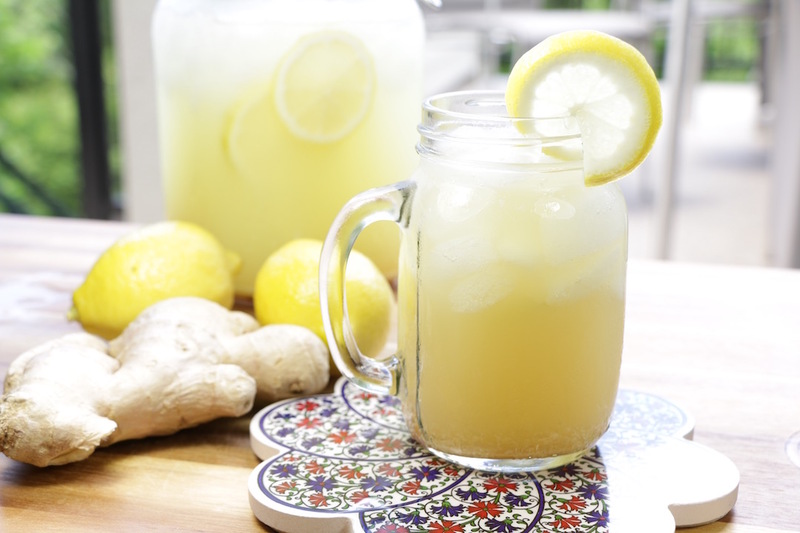 When life gives you lemons make ginger lemonade….right ?!! This easy and refreshing recipe will change the rest of your summer!! Place the ginger in a food processor or blender. Add lemon juice and process until smooth. Add water and maple syrup. Mix well. Serve in glasses filled with ice. Thank you for sharing this recipe. I will be making it for this weekend. Just made it and I absolutely love it! The perfect amount of sweetness without overdoing it! My new summer drink for sure! Absoloutely fantastic!!! The perfect measurements of every ingredient! Love it! I didnt have maple syrup (next time! ), so used agave syrup. So delicious on a 100 degree day. I’m addicted to this drink!!! I just hope it’s good for me cause I love it sooooooo much!! Made this couple months back and I couldn’t stop drinking this! Not to mention I felt GREAT inside AND out! If I wanted to use granulated stevia in place of maple syrup, how much of it should I use? Stevia is very sweet! Taste as you add it to make sure it’s not too sweet! Just came in from the yard and made this. Oh, wow, FANTASTIC! I have been drinking lemon water with some maple syrup in it for years. Who would have thought that all I needed to do was add ginger! It just took it over the top. So refreshing when you come in really thirsty. Thank you! PS: I noticed your video said 1 litre of water and the recipe said 1.5. I would definitely go with the 1.5. Thanks, Yes 1.5 litre is better! Have been looking for something vegan to drink that is refreshing forever. This sounds so good. Will make as soon I get some fresh ginger. Unfortunately I have to change the recipe to make it keto friendly. So no maple syrup. Have to use stevia or monk fruit in the raw. This sounds amazing! I can’t wait to try it. One question – how long can the blend keep in the fridge? For a few days, 3 to 4 days ! I made this today, was so excited from all the comments. I must have done something wrong it was so strong it burned our throat going down, any recommendations? Sure, you can water it down a little or wait until the ice has melted! Husband is watching sugar intake…..would this be just as good without the maple syrup? I’m not sure, did you try stevia? Is this made with real maple syrup or pancake syrup? Pure maple syrup but agave nectar would work as well. It seems delicious.I’ll try it !!!!! I wonder if you could use dates? What was in the jar? Some sort of cloth? This drink help you lose weight? I must try this. I love Ginger…and lemons too! Thanks for the great idea. What’s the name of the song included in the video? gonna use the entire lemon !!! If you are not vegan, sure! How about adding Turmeric, have you tried that?? How much is 70 grams of ginger? 1/2 cup? Many thanks. Thank you for this recipe. I love it..now hoping it fixes my cold and sore throat!! I would think the drink would have a maple over tone taste? Has anyone used honey instead, or would it effect taste or texture ? How is maple syrup vegan? Tree sap’ condensed by man instead of bee. I have white and yellow ginger plants..does it matter?? can I use them? Me lo spieghi in italiano per favore? Since you are straining the ginger and lemon juice pulp, do you have to peel the ginger? Seems delicious. Would try this weekend. Thinking of adding mint to it as well. in it or something. I feel that you could ddo with a few p.c. to pressure the message home a bit, however other than that, that is fantastic blog. I’m not a nutritionist but I don’t think so! Did you also grind up the lemons themselves? I thought I saw lemons in the Vitamix. Will make this for sure. No it would be too bitter, I only use the juice! What do you do with the lemons after squeezing them? It looks like you added them to the Vitamix. Your written recipe says lemon juice, nothing about the lemons themselves. You squeeze the juice and discard the skin.